Trip Advisor and other testimonials. 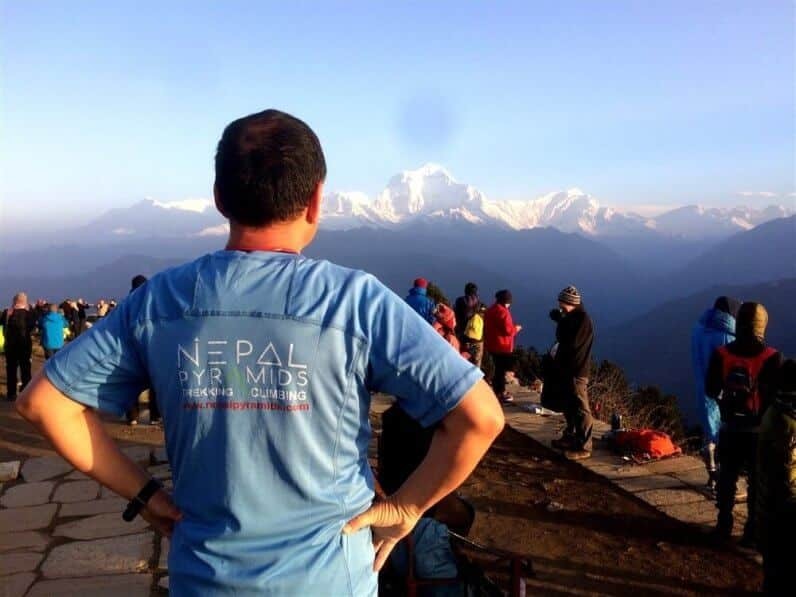 We understand the fact how challenging it is for anyone to pick one particular trekking company from among thousands that survives in Nepal. If you only try to look into the list of trekking agencies in Nepal, they are simply unlimited. To Select one reliable trekking company and book your wonderful holiday is indeed very overwhelming. Furthermore, the rising of local travel agencies are amplifying in numbers in an everyday basis. Besides international companies there are domestic company affiliated with agent companies overseas. Further, there is generous quantity that simply runs as typically local on its own with no overhead reinforcement from foreign companies. No one can actually give you the right figure on how many trekking agencies do really exist in Nepal. There are certainly abundant number of Trekking Agencies in Kathmandu (the capital city) only. However, when it comes to decide on one among thousands of these it is indeed really crucial and very confusing. There are ample Nepal trekking and tour operators who guarantee you so much but in reality don’t deliver what they promise. However, there are certain ways to find the best trekking company in Nepal. There are steps which everyone is to look into before choosing trekking agencies in Nepal. It is always wise whatsoever to trek with the local trekking company as it is unquestionably hassle free. Everything is prearranged prior to your arrival in Nepal. Furthermore, Local companies will be there with the prompt solution to any emergency situation that arises during your stay in Nepal. You get a privilege of having local leaders who are very well with the region. They are well with the area knowledge and can share necessary information more than anybody else. Very significantly it’s TIME SAVING. Once again its very challenging to find best local trekking agency in Nepal. Furthermore, what MAKES or BREAKS your delightful Holiday solely depends on Company or Agency you so choose. As Bill Gates have quoted “If your business is not on the internet, then your business will be out of the business” rightly applies in the now world of business. Besides many other thing Website is a soul of the company. Make sure you apprehend the necessary detail by surfing into the company’s web-page before you sign-up for your holiday. Web-page gives you so much about a company that conveys thorough material of what the company represents and its requirement. Transparency is the symbol of trustworthiness which is furnished by website where you can do thorough scanning. Company shouldn’t be reluctant rather be willing to show their costs, terms and conditions etc. Company’s web-page serves as a complete pack giving you vivid detail either through images; write up, videos or testimonials. The online presence of the company is indeed very important. The info in the website builds up so much credibility as it contains almost everything that can prove the genuineness of a company. See how much of online presence a company has. The quality of a Website also gives you basic idea on their reliability. The well built up website gives you how accessible the company is. When you search for the company just by its name the amount of site links that it shows up in Google also gives you the genuine online presence of the company. To start up a travel related company in Nepal you are to register to certain governmental and private bodies without which it is impossible for a company to be legitimate. Which is to say, every single Nepal tour or Travel companies are to be affiliated with these legitimate bodies. Legal companies are those who are affiliated with government bodies like Nepal Tourism Board, Department of Tourism and office of the company registrar. In case of affiliation failure the company doesn’t reserve the right to issue any permits or acquire tourism license. They need to associate with the private bodies like TAAN as well (Trekking Agencies’ Association of Nepal). Furthermore, if the company is liable of organizing peak climbing trips then they are to register to NMA (Nepal Mountaineering Association). Moreover, they are to get the sanction in doing business with foreign currency from NRB, the central bank of Nepal. People are to check if the company is allied with these authorities to confirm their trustworthiness. And to do this their website is no better place to look into. Usually the details of all these credentials are titled in their web-page as ‘legal documents’. In the world of online business and marketing Trip Advisor have played a vital role furnishing with ample information concerning vacation planning. Before you decide on picking one particular trekking company in Nepal you can always monitor their Trip Advisor reviews. Besides it also provides you with sufficient report over trekking company you are choosing. Reviews on Trip Advisor do really help you on choosing the local trekking company in Nepal. Besides trip Advisor provides you with the client’s email through which you can literally shoot them a mail inquiring about the company and their service. Furthermore most website contains review from the previous clients over the destinations they have done and how it turned into. Anybody has the right to go through the reviews and consider on choosing the agency. Make sure you sincerely look into the services provided by the company you have preferred. Though thousands of people travel to same destination yet there is a variation in terms of services. Almost all trekking company in Nepal promises to deliver the quality service. However, in reality it’s not so. People tend to go for a cheaper company that guarantee to deliver and excellent service. Recently, there has been a scam regarding personal health and rescues which are now under investigation. When you are evaluating the trip costs make sure you check what the company is providing. Clear examination is must. ✅ If your trip includes all ground transportation including pick up and drop. ✅ Make sure if you have a quality hotels in the cities or just a basic guest house. ✅ Question if (for some destination) your trip includes driving or flying options. ✅ What is included and excluded. ✅ If your trip includes tour entrance fees. ✅ Examine the trip duration the company is providing. ✅ See if transportation is private or local. ✅ Check if your leaders are professional, medically trained and license holder. ✅ Uncover if they provide you equipment like duffel bag, sleeping bag, rain poncho etc. ✅ Ensure If they are able in carrying out processes efficiently during emergency situation. ✅ If the staff are insured and paid well. ✅ Find if your food is on fix or in choice menu. ✅ If hot beverages are included or cost extras etc. LET THERE BE NO HIDDEN COSTS. Almost all company website provides you with detail info in their ‘what’s included and what’s excluded’ category. Just because you bumped into some cheapest company promising you with exceptional service then it’s better to give a second thought. It’s always depends on your choice of the company that can make or break your dream vacation. These are some vital things you are to look into to find the best trekking company in Nepal. Trekking in Nepal is a beautiful once in a lifetime experience. It is always very wise to list your requirements, what are you expecting out of a company. And to do this you can always inquire sending an email to the company regarding your requirements, price, and things involved in the offered package. Question the agency regarding your plan, avialabilities, mode of transportation, or the difficulty level. Make sure you are well aware with things before you blindly sign up for a trip with any agency. Identify your requirements and make necessary queries and arrangements that best suites you and your group. Besides all these see if your company is genuinely interested in your queries. A company with a prompt response to your queries and giving easy communication certainly demonstrates of its sincerity. Examine if they actively participate over your plan counseling and giving you ample alternatives. The company shows their genuineness by honestly offering things that absolutely suits your requirements. However, you can realize the incompetence of the company recognizing the fact that some are simply hell bent on selling their packages. Make sure the company you are booking your vacation with in Nepal does their homework. They should have broader knowledge and updates with necessary information regarding their undertakings. Confirm if they have complete information over the trip you are signing for. They should be well prepared with their keen research over things and uncertainty about the region or place you are travelling. The company must be able to answer all your genuine queries with precise response. In cases of not being very well-versed, nonetheless, they should be able to revise and update you after necessary research. It is to say that your company should be well aware of the things that you may encounter in Nepal during your vacation. Hope this blog would assist you to find the best trekking company in Nepal.